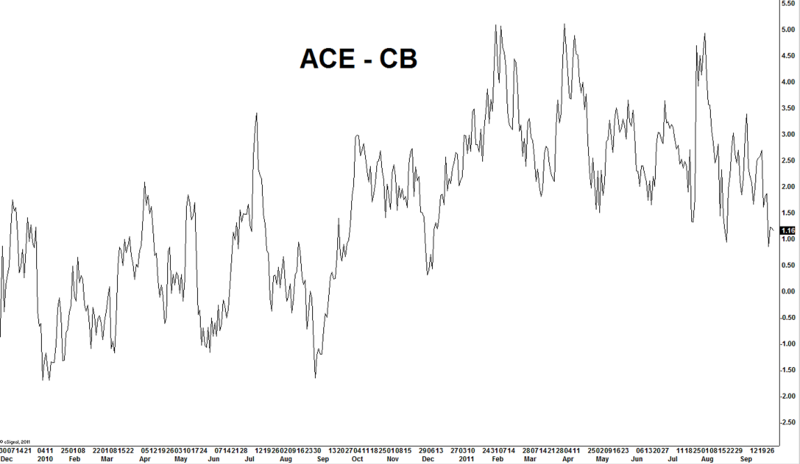 The trade is to be long $ACE and short $CB. Last time we looked at this spread was back in early August right as the market was rolling over and we were trading it the other way. The risk here is the spread breaking below 0.50 and 0.00 and tests -2.00 or lower. This will most likely occur if $ACE breaks 52-week lows and $CB doesn’t. Target if the trade works is 2.50 to 2.80. Earnings are on October 20 for $CB and October 25 for $ACE, so there’s your timeframe.